Bellows Falls, Vermont is a transportation hub between metropolitan Boston, MA - New York City - Albany, NY - and Montreal, Canada, as it was nearly 300 years ago. Today, served by two Interstate 91 exits, NH Route 12, the Boston and Maine Railroad and Amtrack's Vermonter, the Hotel Windham looks out over the Connecticut River, an historic Scenic Byway adjacent to the oldest river canal in the United States, and on to New Hampshire's Fall Mountain. The Connecticut River long ago created a series of level terraces adjacent to a long and narrow gorge known as the Great Falls. The short distance between shores enabled the construction of the first bridge (1785) anywhere on the entire 410-mile-long river, making Bellows Falls an important river crossroads. At a time when travel by river was more practical than overland, a series of eight locks on the Bellows Falls Canal (1791-1802) lifted boats a height of more than fifty feet around the gorge. It was one of the first transportation canals constructed in the country, and was completed more than two decades before the famous Erie Canal. Looking to the south end of The Square, one of the early Hotel Windham predecessors was located at the far corner of the side walk on the left where the street clock can be seen. In 1849, two railroad lines converged in Bellows Falls, making Bellows Falls a railroad hub. The railroad stimulated the growth of local industries like the Vermont Farm Machine Company, which manufactured farm and dairy equipment, and the Bellows Falls Cooperative Creamery, which processed and distributed milk from farms in the region. After the railroad arrived, the transportation canal became a system of flumes that directed water to one of the largest paper-making complexes in the world. The company that in 1869 was among the first to use wood pulp for making paper was later one of 13 consolidated to form the International Paper Company in 1898. 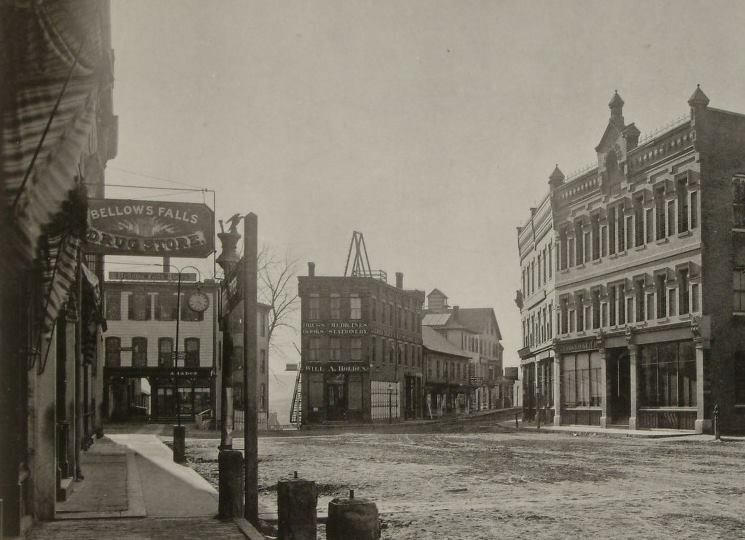 One of the earliest postercard photographs of the Village of Bellows Falls, On the Square, as it looked in the late 1800s. Looking at the north end of The Square, the four-story hotel, on the right, was destroyed in a 1932 fire and replaced by the current three-story Georgian Revival classic. A postcard photograph of the four-story Hotel Windham On the Square in Bellows Falls just before the great fire of 1932. The Georgian Revival Hotel Windham as it was constructed on the original hotel site in 1933 after the great fire. A Harper and West, Architects 1932 pastel rendering of the proposed Hotel Windham Lobby. The Hotel Windham's recessed paneled doorway proposed by Harper and West, Architects in this hand rendered elevation drawing. The interior photo below shows the 1933 Windham Coffee Shop Façade, located adjacent and to the left of the hotel entrance, as viewed from the exterior. The façade was replaced after J. Emerson Kennedy bought the hotel from his partners in 1944 and sometime later, after the family sold the Hotel in 1966, the facade was 'remuddled' with plywood, aluminum and plate glass. A 1933 interior photo of the Hotel Windham Coffee Shop Facade. 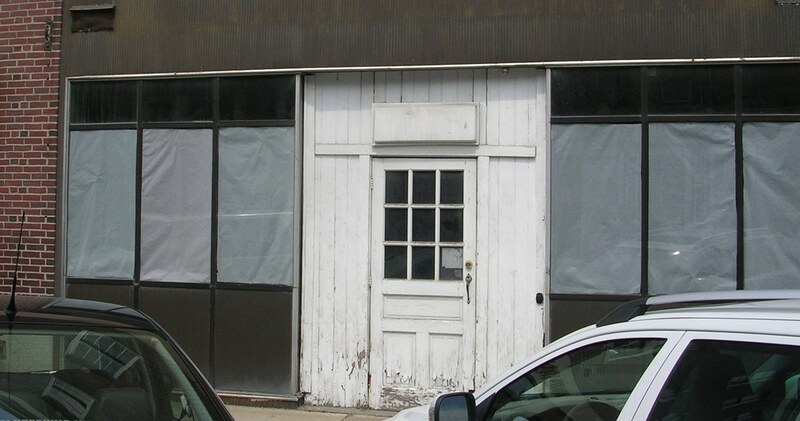 This facade was changed after the building was purchased in 1944 and included an automatic door opener. Then, after 1966, the facade was 'Remuddled'. See below. The Windham Coffee Shop facade as it was 'remuddled' sometime after 1966 with plywood, aluminum and plate glass. The remuddled modernization was removed in 2009, exposing precious few of the original facade architectural elements. Fortunately, enough detail was uncovered to allow the original facade to be accurately replicated. See below. 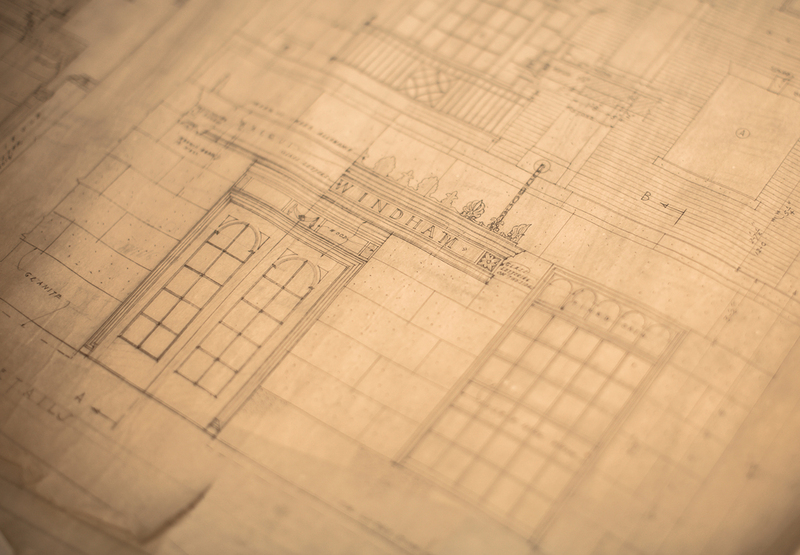 The 2010 Woodstone Shop Drawings of the Windham Cafe façade projected from excavated original architectural elements. How was the Windham Coffee Shop façade replication accomplished? Of the 15 arched transom panes of glass at the top of the facade, five were found buried in the wall when the remuddled facade was excavated. By projecting the dimensions of the original elements within the existing masonry opening, Woodstone technicians were able to accurately project the design and detail of the original fenestration. When the replicated facade was installed, it matched the foot print of the original facade that was found on the original concrete floor slab. It is interesting to compare the 1933 interior photograph of the façade and the Woodstone elevation drawings to the photo below of today's replicated Coffee Shop façade. The accuracy of the fenestration details and alignments are unmistakable and the same attention to detail has been taken with all of the Hotel Windham resortations and replications. The Coffee Shop facade, replicated by The Woodstone Company [http://www.woodstone.com/], as it appears today from inside Popolo Restaurant. The replication was completed in 2010. The Hotel Windham Sun Porch, restored in 2010. For years, the business day began here for many in Bellows Falls and it serves today as dining and event space sponsored by Popolo and various village organizations. Inside the original french doors, pictured open above, is the Hotel Windham Ballroom. The Boston & Maine railroad tunnel runs directly beneath these rooms. The Boston and Maine Railroad Tunnel is a truly unique feature to the Hotel Windham, running directly beneath the hotel ballroom. In 1851, the Vermont Valley Railroad constructed this 400-foot tunnel to carry its Brattleboro line (now the Boston and Maine Railroad) beneath the emerging commercial center of Bellows Falls. The single-track tunnel is lined with coursed cut-stone blocks; on the portals, radiating voussoirs outline its round-arched ceiling. During the 1930s and 40s the Hotel Windham was a destination for the 'snow trains' from Boston. Because accommodations at the ski mountains was limited in earlier years, skiers would gather at the hotel after a day trip from the city and then hit the slopes. Looking south, the Boston & Maine Railroad Tunnel runs directly beneath the Hotel Windham ballroom. The steel bridge, pictured above, extends over the oldest river canal in the United States to the historic Bellows Falls train depot. 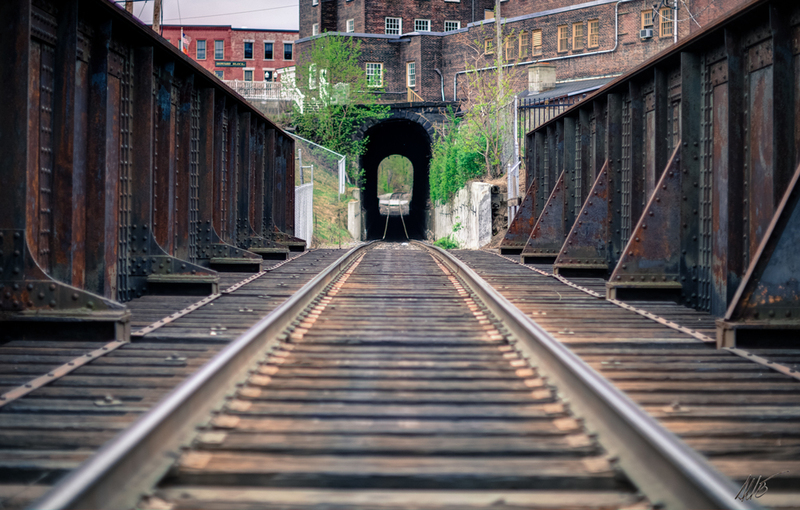 The Boston & Maine railroad tunnel looking north. In the 1970's, and again in 2007, the floor of the tunnel was excavated and the track lowered to allow passage of extra-height contemporary rolling stock, e.g., auto rack cars and "piggyback" equipment, on this important main line. While the tunnel runs directly under the hotel ballroom, there is nary a notice of the train as it passes beneath. Only the train whistle betrays its passing as the Amtrac Vermonter approaches the historic Bellows Falls Railroad Station. Several years ago, the train station was featured in the movie Cider House Rules. The railroad turn house on the east bank of the Great Falls. And here, again, is the grand Hotel Windham as it appears today, On The Square in the historic village of Bellows Falls, Vermont. The classic entrance of the hotel, on the southernmost four-bay section of the west elevation, is distinguished by a concentration of stylistic elements. Sheltered by a suspended metal canopy, the Hotel Windham's recessed paneled doorway is flanked by transomed double hung windows, crowned by keystoned semicircular blind arches (repeated on the first three bays of the south elevation). Above a wide stone belt-course, brick pilasters separate the upper story bays, rising to Ionic capitals supporting a full stone entablature surmounted in turn by a brick parapet inset with groups of stone balusters. The stone entablature continues in diminished simpler form across both west and south elevations while the parapet continues only across the south elevation. Second and third story window fenestration on the hotel consists of regularly spaced openings (grouped in three's on the west elevation) framed with keystoned lintels and stone sills. In 2008 and 2009 the original weight and pulley sash were precisely replicated with energy efficient weather-strip and insulating glass, still in their original frames and trim with the original sash locks and lifts. An enclosed 'sun-porch' projects from the east half of the south elevation; between the large recently replicated multi-pane casement windows, as paired and triplet pilasters rise to support an over-scaled entablature.